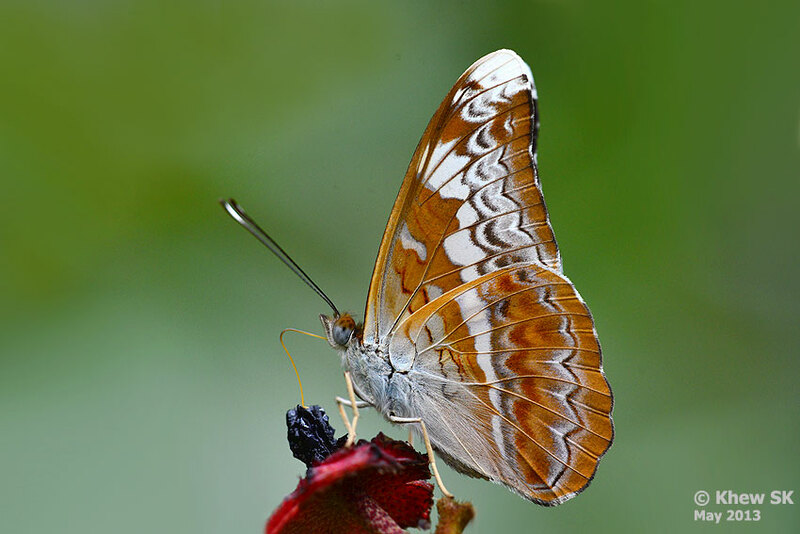 The subspecies parkeri of the Knight that was originally discovered by Norman Parker in Singapore has its submarginal area on the upperside of the hindwing a pale violet-blue. This subspecies is believed to be endemic to Singapore. The south Malaysian subspecies, malayana has the submarginal area of the hindwing a reddish brown. In recent years, this subspecies has been observed in Singapore, and hybrids with the hindwing showing intermediate characteristics between subspecies parkeri and malayana have been observed. 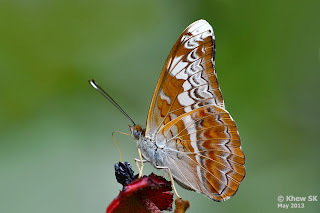 This pristine male Knight (identified by its white wingtips) was feeding on the ripened fruits of the Singapore Rhododendron when I managed to take a number of shots of it with its wings folded upright. Although skittish, it has a weaker flight than the more alert Commander but has the same habit of perching on the top surface of a leaf, just out of reach of the photographer's lens.